A few weeks ago I had the fantastic opportunity to present “Fight to Win, Sales Lessons from Sport” at the Riverbed regional sales conference at the Courtyard Marriott in Bali. There were three key themes that Riverbed wanted me to share, one of which was managing change. I believe that the ability to manage change on an ongoing basis is a crucial key to success in sales, business and indeed life. Likewise, in my opinion, it’s virtually impossible to be successful in sport if an athlete and his or her team can’t respond appropriately to change. I think there are few athletes that manage the degree of change on a daily basis that professional cyclists do. 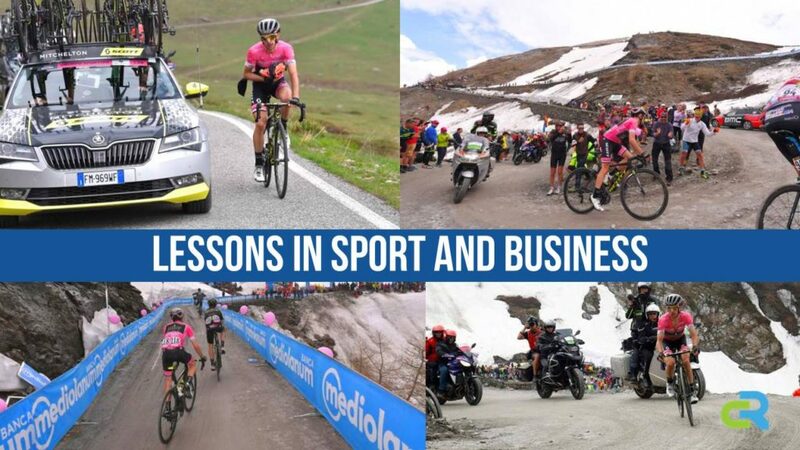 A large part of my presentation focused on the recent amazing success of the Mitchelton Scott team at the Giro d Italia. I started the pre-dinner talk by riding my bike to the stage from the back of the room to highlight that the ability to respond to the unexpected often determines success in sport, business and indeed life. How often have you walked into a client or sales meeting with a pre-conceived idea of how it will pan out only to be blindsided when the client rides in on their proverbial bike from the back of the room? Were you able to respond appropriately to find a successful outcome for both yourself and your client or prospect? What were the lessons? Similarly, I believe that the ability to manage change on an ongoing basis is another key to success. In my opinion, there are few athletes that manage the degree of change on a daily basis that professional cyclists do. I shared the recent amazing success of the Mitchelton Scott team at the Giro d Italia. Some people may have viewed Simon Yate’s loss of the pink jersey just three days from Rome as a failure but this would miss the incredible achievements of the team. While the armchair viewer may have marveled at the constant change of topography, stunning scenery, weather and tactics as the teams rode over 3,500km with nearly 4,500m of vertical climbing many would be unaware of the never-ending change off the bike. Each day, after riding for sometimes as long as five hours, the teams often spend a few more hours transferring to the team hotel. This year that amounted to nearly 6,500km as well as two flights in a race that started in Jerusalem and ended 21 days later in Rome. The athletes would have probably slept in around 20 different beds over the three weeks. They would seldom have been the luxury four and five star rooms that many sales teams are used to. Almost always two to a room, often single beds and regularly in two and three star pensions. Add to that drug tests, media engagements and managing falls and other injuries and know that it’s pretty much impossible to succeed if both the athlete and the team are not equipped to prepare for and respond to constant change. How well is your business prepared for daily expected and unexpected change? So three days from Rome Simon Yates started out in the Pink Jersey, within touching distance of the goal that the team had set before the season started when “disaster” struck. He had a terrible day to drop over 35 minutes on the leaders and not only loose the pink jersey but slip way out of the top 10 on the leaderboard. I shared a montage of four pictures which told a story that I believe is so relevant to business. Firstly, Simon riding alongside the team car being encouraged by team management in probably one of his darkest hours. How do you as a manager support your star performers when they are a having a bad day or week or month? Are you alongside in the team car coaxing them along and providing support or are you up the road looking for the next star. Are you only supporting your stars or do you support the entire team? The second image showed him standing up out of his saddle struggling around a sharp hairpin on a rough gravel road with snow on the verges and a small crowd cheering him on. How does your team and business respond when the road gets steep and rough and the environment cools off? Do you get out of the saddle to give it your all or do you give up, get off the bike and walk? Do you get dispirited when the crowd that is cheering you on becomes sparse or do you push on hard for the summit? The next picture showed Simon struggling up another incline with two of his team mates just ahead waiting to encourage and “tow” him up the hill. Cycling is fundamentally a team sport. Winning a race is all about team work with “domestiques” sacrificing themselves on a daily basis to help the designated leader. This involves protecting him or her from the wind and rain, collecting food and drinks and even handing over their wheel or bike in the event of a puncture or mechanical failure. It is impossible to win a major race without strong team support. On occasion the role is reversed where the team leader sacrifices for another member to help them win a stage. How cohesive are you as a team? Are you prepared to “sacrifice” for each other? Is it only the “workers” who are expected to sacrifice or are the leaders prepared to play their part? The final picture showed Simon on his own struggling up another incline being followed by the camera’s as they relayed his struggle to millions around the world. How do you as a leader respond when you are isolated and under the glare of the spotlight whether it be the media, the Board or senior management? The team and personal dream of winning the Tour of Italy had been shattered but the very next day they regathered, refocused and another member, Mikel Nieve, went on to win the penultimate stage of the race. The following quote from Director Sportif, Matt White, sums it up. “The incredible win of Mikel Nieve directly after the disappointment of losing our dream shows the real character of this team”. How does your team respond when you lose a major deal that you have been working for months or even years on? How long does it take you to re-calibrate and focus on the next goal? Does it take days, weeks or months to re-gather momentum? Chris Froome went on to win Stage 19 after an audacious “attack” on the day when Simon Yates faltered and ultimately won the overall race and coveted pink jersey. In the process Froome became the first Briton to win the Giro and only the third rider in history to win all three of cycling’s Majors, The Grand Tours, which include the Tour de France, the Vuelta a Espana and the Giro d’ Italia. His win was not without controversy. He was and still is in the midst of a legal battle to clear his name after twice the permitted levels of salbutamol (an asthma drug) were found in his system at the Vuelta. Many people thought he should not have even started the race. I showed a picture of a couple of spectators running alongside him dressed as giant inhalers. My point had nothing to do with whether Froome is guilty or innocent, but to highlight that in sales, business, and indeed life it is not always a level playing field. Whether perceived or real the ability to focus on playing the hand that you have been dealt rather than wasting energy on what you can’t control can often be a determinant of success. How good is your team at recognising possible “inequalities” but then putting them aside and focusing on the objective at hand? Whilst Mitchelton Scott ultimately missed the huge goal that they had set to win the Giro there was much to celebrate. Five stage wins, 13 days in the pink leaders jersey and many lessons learned both on a personal and business level. Do you take the time to celebrate the small wins in life and business whilst recognising their key role as building blocks to ultimately scaling the highest peaks? A few years ago I was fortunate to help facilitate a media session in Singapore with LA silver medallist and BBC athletics anchor, Steve Cram. He made what I thought was an interesting observation. He believes “sport is a microcosm of life”. So if your business were a sport what values, rules, principles and character would it embody. What can you learn from sport and what can sport learn from you? To listen to the full presentation, click HERE.